Fool's Gold: Afro-Hebrew Dance Music The L.A. band Fool's Gold has really gotten off the ground in 2009. The group's sound is firmly planted in popular African styles, including the guitar music of Congolese rumba, Tuareg desert-blues and '70s Ethiopian soul, among others. Hear the Hebrew-language Afro dance band in a session from KEXP. The L.A. band Fool's Gold has really gotten off the ground in 2009. Formed over the past three years as a loose collection of friends, the group recorded its first album in the spring and embarked on its first U.S. tour in the fall. Led by guitarist Lewis Pesacov and singer/bassist Luke Top, Fool's Gold's members come from indie-rock bands such as Foreign Born, We Are Scientists and Edward Sharpe & The Magnetic Zeros. But the Fool's Gold sound is planted firmly in popular African styles, including the guitar music of Congolese rumba, the Tuareg desert-blues of Malian groups such as Tinariwen, and '70s Ethiopian soul, among others. 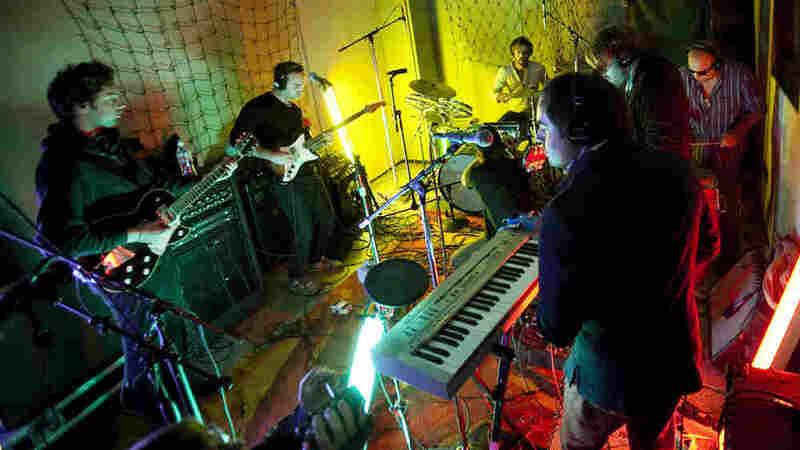 The three tunes that Fool's Gold played at KEXP during this in-studio session were the same ones that open its debut album. The original twist for Fool's Gold is that its original songs are sung in Hebrew. As singer Luke Top, who was born in Israel, was writing these songs with Pesacov, he found that his native language worked well with the African sounds. Fool's Gold has pared its touring band down to eight members — down from the 15 who performed in the band's early days — who do a great job of creating original music that captures the spirit of the African genres, while still crafting a new blend of what Luke Top calls "Afro-Hebrew-soul-pop-dance" music. After this session at KEXP, Fool's Gold performed at the CMJ festival in New York; early next year, it'll make its debut in London and Paris, at which point its worldly sound will become one with the world. Want to hear more Favorite Sessions? Click here.